Centre for Autonomous Systems, Faculty of Engineering and IT, University of Technology, Sydney, NSW 2007, Australia. Nondestructive testing, Magnetic ux leakage, Finite element analysis, Data driven inference, Gaussian processes. 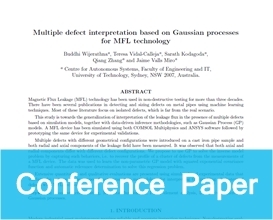 ling of clusters of defects with MFL technology.